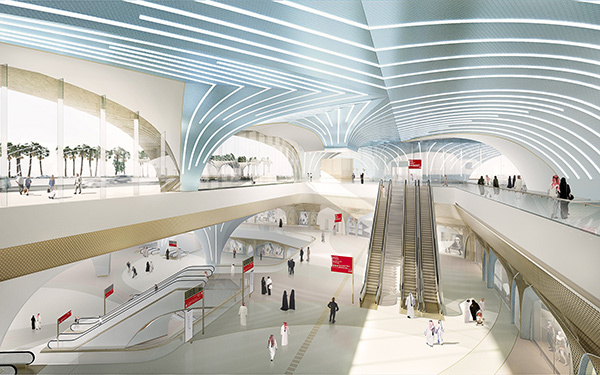 Overview: Appointed as the principal architect for the Qatar Integrated Railway Project (QIRP) which will extend to 60 stations, the design forms a bridge between past and future, drawing inspiration from the vast regional architecture lexicon while representing an effective vision of modernism and preservation. With its strong identity, this new network creates instant recognition at busy intersections, serving as a permanent reminder of the alternative to private transportation. The full network is planned to comprise four lines connecting the GDA as well as Al Khor, and Al Wakrah-Mesaieed communities located north and south of Doha respectively. SCALES OF IDENTITY: A key concept within the design is one of creating varying scales of identity for the user: network identity, line identity and station identity. 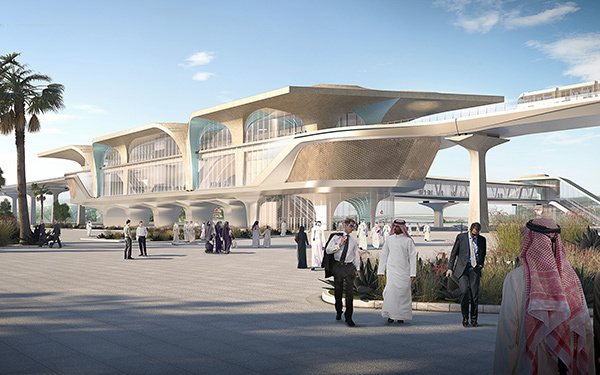 Network identity reflects the overall Qatar Rail brand using recurring design elements that will shape the architecture of the stations consistently throughout the network and will offer brand recognition with Doha’s urban fabric. Line identity is achieved by creating different atmospheres within the stations for the theme of each of the metro lines (Historic line, Coastal line, City line and Education line) through distinct wall and floor treatments, as well as through material applications that orient and guide the travellers through their journey. Individual station identity is achieved by displaying features positioned at strategic points in different areas of each station. The content of these features is specific to each station and is related to the local context and/or to the line theme. By integrating curated content throughout the stations, the Metro Network will serve as a cultural vehicle for Doha. VAULTED SPACES: Building upon existing elements found in the architecture of the region, in the architectural branding vision, the ‘Vault’ represents a new referential bridge between Qatar’s historic architecture and culture and its future as a beacon of innovation and prosperity. Drawing inspiration from the arch, expressions of traditional architecture, the lightness of the dhow sail, and the tensile profiles of nomadic tents, the ‘Vaulted Spaces’ design proposes a contemporary approach to the interpretation and morphological implementation of these elements. Through a system of interconnected triangular base forms, the massing of the geometry adapts and transforms to incorporate programmatic functions and to connect interior spaces with exterior urban infrastructure. ADAPTABILITY: The scale of the Metro intervention in Doha requires careful planning in order to comply with a strict time schedule and achieve minimum disruption in the urban environment. Flexibility becomes a design and planning objective at all levels of intervention. Using a large catalogue of architectural ‘branding’ elements, the design proposal represents a flexible new architectural system which can adapt itself to the scalar challenges set within the Metro Network. OYSTER: The materialisation principles are experienced through a duality of a pure, modest exterior versus a rich, illuminated mother of pearl effect interior. The exteriors reference the monolithic strength of old Qatari architecture, while the interior spaces create a radiant effect of movement and fluidity. The use of this uniquely Qatari ornamentation and material palette assists in dividing the large interior spaces and guiding pedestrians towards the transient spaces. The integrated light lines amplify the experience, function as natural wayfinding elements and contribute to a unique ambience for the Metro Network. CARAVANSERAI: Referencing the notion of Caravanserais – which were inns with enclosed courts that served as gathering and resting places on ancient trade routes – and following in the lineage of historic train palaces, the design generates social interaction and propagates place creation over space creation. Drawing on this tradition of key reference nodes along a travelling route, a sequence of wall attractors within the transient space of pedestrian flows create moments of diversity, opportunities for calmness and gathering and showcases for local culture and identity.